We find hundreds of reviewers to give honest opinions of your work. We execute a viral online marketing campaign so your book gets the recognition it deserves. All the momentum created will drive sales and you finally get rewarded for all your hard work! "The author's world creation abilities are simply second to none and his descriptions of the Immortals and their lands are incredible and interesting. 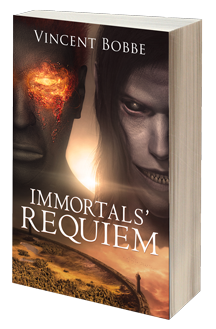 Any reader who loves fiction, fantasy, adventure or thrills should absolutely read Immortals' Requiem! I am so pleased to be able to recommend this book, and look forward to reading more from the very talented author, Vincent Bobbe, in the near future!" "Vincent Bobbe writes with a unique voice, a powerful tone, and prose whose beauty is timeless, evoking images that reflect the setting of this gruesome tale. I am not a fan of supernatural stories, but I was gripped from the start by Immortals’ Requiem, especially the dark world which it invites readers to enter, the awful creatures of eternity, and the brave men who fight to preserve humanity. The plot is beautifully woven and the dialogue is enticing. This is a great success in the supernatural genre." "The novel opened with a bang and you are literally sucked right into the story. Opening with a supernatural character ensured that I was hooked. I enjoyed the atmosphere and the mood of the novel. I enjoyed the dialogues and the ramblings of the mythical characters. Plus, it was very well written. Bobbe did a great job with creating a superb novel that I would share with my friends." "Immortals’ Requiem by Vincent Bobbe is more than just a fantasy novel. It contains elements of the horror genre which include violence, corpses and mutilation, as well as elements of the supernatural or the occult. Along with that is a fast-paced thriller with plenty of adventures. In that sense, the book is a mix of genres and the writing style seamlessly blends different styles. This is a book that fans of horror or pure fantasy fiction will surely love. 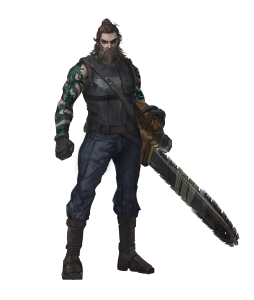 "Vincent Bobbe sprinkles this epic novel with enigmatic gods, ruthless villains, and driven warriors. We get glimpses of life before Christ, and the expanding Roman Empire before the battle resumes in modern Great Britain. 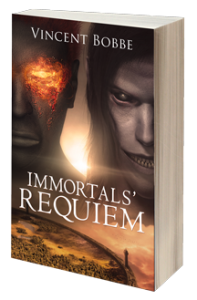 A great plot, interesting characters, and the feel of all human history as a setting make Immortals’ Requiem a great read. If you have a weekend with nothing planned and you just want to lose yourself in a good book, then this is exactly the kind of book to get. It will actually feel as if you took a very long vacation ... far, far away." Jump Start Publishing was set up in September 2016. It was created after a recognising the chasm between authors writing their books and actually getting people to read them. The idea for the company originated over a drink one evening with a group of friends. The conversation turned to one friend discussing how he’d spent years creating his first novel and had recently self published it. His book was now proudly being listed on some of the major book selling sites, however he had no idea how to actually get people to read it. Jump Start Publishing was set up in September 2016. It was created after a recognition of the gaping chasm between authors writing their books and actually getting people to read them. The idea for the company originated over a drink one evening with a group of friends. The topic turned to one friend pointing out he’d spent years creating his first novel and had recently self published it. His book was now proudly being listed on some of the major book selling sites, however he had no idea how to actually get people to read it. Whilst discussing how he might go about getting his book in the public eye we realised that between us we had decades of marketing and IT skills we could fully utilise to overcome his problem. Using state of the art IT techniques along with modern marketing strategies we were confident we could get a good book that nobody had heard of to go viral. The next morning after a few calls we decided to make a go of it and here we are. If you’re reading this then we’re doing something right! Based in the United Kingdom we are an up and coming company that intends to take one author at a time and “Jump Start” them in to the limelight. Our ultimate aim is to get them fast tracked to the top pile in front of the major publishers. If you'd like to get in touch with us for any reason then please use our contact page and we'll get back to you as soon as we can. For those that would like to delve a little deeper. Are you a major publisher? Currently we are just getting started. Our initial goal was to jump start new authors in to the limelight to be picked up by one of the major publishers. Since that initial premise we've realised that being independent we are much more flexible and efficient than some of the big players so authors might want to stay with us, it's entirely up to you. We aim to take over the difficult process of marketing that most people struggle with when they first start in the publishing world. See above for a simplified view of what we do to achieve this. Either way if you do decide to leave us It is a lot easier to approach a major publisher when you have lists of positive reviews with proof of sales and an already growing fan base. For the first book we jump start we charge 50% of the profit taken from the book after our initial costs have been recovered. This may seem a lot but we take all the risk and put all the up front costs in to creating marketing material, websites, editing and proof reading your work, promoting as well as all the server and website costs of handling a complex viral campaign. This runs well in to the thousands of pounds to do it right and as we are taking so much financial risk we believe this to be a fair deal. This is only for your first book however, after this it drops to 15% (a standard literary agent fee) for every book we continue to jump start until you get taken up by a major publisher or a good literary agent decides to take you on. Do I have to go to one of the big publishers or can I stay with you? Some authors decide they would prefer to stay with us rather than going to the impersonal big boys of publishing (a dying breed lately!). They find that just because a large publishing company takes you on, they don’t necessarily put in the time, effort and money we do to get you out there. Some authors have even told us that once signed they are left to their own devices and the publisher takes a cut for doing nothing! I guess we’re a bit like the Jerry Maguire of the publishing world, we have a very small customer base that we focus all our time on. We are happy to keep you on board for as long as you would like to be with us. After the first book if you’re happy with your sales you might decide staying with us is the better option in the modern world of self publishing, but the choice is yours. What happens when I get picked up by one of the major publishers or a literary agent? When we’ve created enough buzz around you and your book the big players may want to step in and you may decide your career will be better off with them. If so we will change our contract with you to just 5% of all future advances, flat fees and royalties you receive for any books you publish from that point on. This means we share in the success of taking you from an author nobody has never heard of to being a fully published author of note. To be clear, at this point we shall step back and hand over all marketing to your new publisher / agent, we will receive 5% of all profit you make from all future works without us being involved in any way. This set up means we have a distinct interest in making you as successful as possible and allows us to keep the business growing to find new authors to jump start once you’ve made it. This is how recruitment agents work and that’s what we are but based in the publishing world. The question you need to ask is do you want 95% of something, or 100% of nothing? Will you jump start my book? We get a LOT of requests to jump start books, we do read them and try and get through as many as we can so feel free to contact us via the Contact page and we will take a look. Please understand that we focus mainly on fantasy / fiction books and currently jump start only one author at a time (this will grow as more authors jump start allowing us the resources to expand). We can’t get back to everybody so if you don’t hear back from us please do not take it personally. We may well pick up your book further down the line and give you a call. How long will you jump start my book for? Before investing in a book 5 independent reviewers will have looked at it to ensure we only market what we consider to be the best. If the sales are then coming in, the reviews remain good, and you are happy to stick with us, we will keep pushing and marketing your book indefinitely. If unfortunately your reviews aren't good and sales aren’t as expected we will review future plans and discuss with you how to progress. Ultimately we may decide to stop marketing it. How soon will I receive payment if you jump start my book? Getting a book published is a slow process that takes time to build momentum. It could be months until the ball starts rolling and the sales pick up. See the 3 Simple Steps section for more details on how we go about this. We generally see an exponential growth in sales over time but initially it’s slow and understandably a lot of authors lose faith. Some books can take off quicker than others, but patience is the key here. We will keep you updated as to progress throughout the process but for the first 3-6 months Jump Start publishing will actually be losing money while we lay the ground work to get your book in the public eye. When sales pick up and our initial investments are recovered we reach the reward stage and the money will start coming in. If it happens sooner then you will get paid sooner, but realistically, please expect at least 6 months before you start to receive regular payments. We are a relatively new company at present and understand this list is not exhaustive. Please do not hesitate to get in touch with us on our contact page if you have any further queries. We don't list our contact details on the website due to the amount of spam we have received in the past. If you would like to know more the only way to get our attention is via our contact page.